Removing applications is generally the same in all versions of Windows. Just follow these steps to uninstall programs you no longer want to use in Windows Vista. 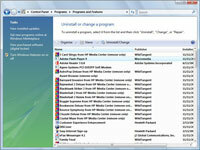 You can find Uninstall a Program under the Programs category. 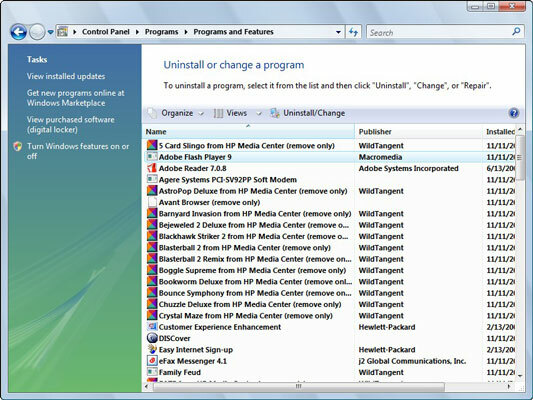 2Click a program and then click the Uninstall/Change button. Although some programs will display their own uninstall screen, in most cases, a confirmation dialog box appears. If you’re sure that you want to remove the program, click Yes in the confirmation dialog box. A dialog box shows the progress of the procedure; it disappears when the program has been uninstalled. Just be careful! When you click the Uninstall or Change a Program button, there are some programs that will simply be removed with no further input from you. Be really sure that you don’t need a program before you remove it. This closes the Uninstall or Change a Program window.